Asociación Española de Marina Civil - Why the Aral Sea is dryed? Why the Aral Sea is dryed? The primary effect of the Aral Sea desiccation has been the significant loss of water in the sea. The water level has dropped approximately 23 meters since the onset of its primary sources of water being diverted (Zavialov 2005). Although the water level has fluctuated up to a few meters in the past due to natural variability in the water flow from the rivers, by 1970, the water loss exceeded the limit of natural water level variation that has occurred in the past. The water budget is determined by several components: Inflow from the river, evaporation, precipitation rates, and groundwater inflow. Net evaporation is defined as the difference between evaporation and precipitation at the surface (Micklin 2007). The river inflow has been rapidly decreasing since 1960. Net evaporation has also decreased, but at a slower rate while the groundwater inflow has remained approximately the same. As a result, there was a net deficit of water to the sea. The figure below shows the components of water balance that resulted in the net deficit of incoming water flow (Micklin 2007). In the first desiccation period, water level dropped by about 21 cm/year. In the next decade, water level decreased by 57 cm/year, and afterwards the drop in water level started accelerating faster. The acceleration of the rate of water loss from the Aral Sea can be explained by the positive feedback between evaporation and Sea Surface Temperature. As the lake loses water, it becomes shallower. The incoming solar radiation for a given square area now has to heat up a smaller volume of water, thus the water temperature at the surface increases faster. This in turn lowers the specific humidity at the surface, which further increases the rate of evaporation, thus eating a positive feedback loop. Another factor that accelerated the evaporation is that the salinization of the lake has lead to vertical stratification. Stratification is characterized by a rapid change in water temperature and salinity level at a given horizontal or vertical region. Under this condition, the surface of the lake has a much lower salt concentration than the bottom of the lake, and thus heats up faster than if the salt concentration was distributed evenly. After 1990 the rate of water loss has been slowly decreasing. There are negative feedback systems that could have slowed down the loss of water in the region. First, is that as the sea surface area decreases, so does evaporation, which slows down the desiccation process. Another negative feedback is due to increased salinity - as salinity increases, the evaporation also decreases, which partially offsets the positive feedback of water loss. Overall, the presence of both positive and negative feedback systems influences the rate of water loss in the area. The desiccation of the Aral Sea was also characterized by a sharp increase in the salinity of sea water. The salinity of water is determined by the mass of salts dissolved in the water and the volume of water. As the sea level dropped because of water loss, the inflow of salts to the sea exceeded the salt discharge, and as a result, salinity levels of the sea rose. In the first decade, the salinity increased by 14%, which exceeded the threshold for many commercial fish (Glantz 1999). As a result commercial fishing catches fell from 43,430 tons in 1960 to zero in 1980 (Bosch, 44). From 1960 to 2004, surface salinity increased from 10ppt in 1960 to 92ppt in 2004 (Zavialov 2005). The steep rise in salinity is one of the curses that hit the Aral Sea region when the Sea started shrinking, and is, with the visible water loss, the element which alters landscape the most. As the sea separated into different parts, the difference in salinity between the eastern basin and the western basin also started growing, with higher salinization in the eastern (smaller) basin (Zavialov 2005). Scientists were able to observe two types of correlations between water and salt which increase the salinity of water as a result. Negative Correlation: This obvious correlation explains how the diminishing level of water creates more salinity, as a given amount of salt gets diluted into a smaller volume. The diminishing level of the Aral Sea has therefore caused the steep rise in salinity (V.M.Lelevkin). Considering this fact, and based on changes over the last 40 years, we can predict that melting glaciers, growth population, and an increasing trend of water usage will lead to less water flowing into the Aral and thus to an increase in salinity. Positive Correlation: It happens when both underground water and salinity rise at the same time. When agriculture uses furrow irrigation, soil receives an excessive amount of water from rivers and canals. Water then gets filtered by depositing the salt in the soil. Excess water accumulated in groundwater that remains after filtration raises the water table (top layer of underground water). Risen groundwater dilutes and moves upward the salt resting in the soil. Water moves upward and salt concentration increases in the surface layers of the soil. The water then evaporates during day time, leaving the salt behind as it becomes like a layer of snow on the surface of the ground. Similar effects have been observed in Australia as well (Australian Academy of Science). The desiccation of the Aral Sea has been accompanied by the change in the Sea Surface Temperature. We see that the summer SSTs have been increasing, while winter SSTs have been decreasing (Zavialov 2005). This is expected because as the sea looses volume, it's heat capacity is reduced, therefore it can warm up and cool off faster than before. The day to night variations in SSTs, which are responsible for the sea breezes, have also increased. In a sense, Aral sea has started to exhibit a monsoon climate, which is characterized by seasonal climate change due to warming & cooling of the sea. The desiccation period was also characterized by less ice covering of the sea (Zavialov 2005). This can be explained by the fact that increased salt concentration lowers the freezing point of water; therefore the temperature would now need to be lower for the water to turn into ice. The Aral Sea region experienced significant desertification during the desiccation period. The desertification is characterized by degradation of the land and natural resources to the point that they can no longer be used. Several factors influence the desertification, including the decline in the groundwater level. By cutting off water supply to a region, the hydrological balance of the area becomes offset as more water leaves the region than is coming into the region. Frequent low-water periods contributed to the shortfall of needed resources for vegetation. The decline in the groundwater level in the Amudarya and Syrdarya deltas contributed to the piling up of salt at the surface.This increase in salt content was later accompanied by a change in vegetative cover because the plants began to die away as a result of the increased salinity of the sea. As a result, vegetation in the region was reduced by at least 40%. A side effect of the decrease in the protective vegetation cover was intensified winds, which led to more dust storms in the area. Six million hectares of agricultural land were destroyed as a result of salinization and desertification (Bosch 2007). A sharp increase in salinization of lands is one of the most negative consequences of Aral Sea crisis. Groundwater level decline also caused salt accumulation in the subsoils. This led to increase in salt deposition in the soil profiles and reeds were replaced by grass saltworts as a result, which prevented anything from growing there. Salinization of soils accelerated the desertification process as it accompanied the sharp decline in groundwater level and the drying of subsoils. This eventually lead to soil erosion, one of the primary reasons for extensive fertilizer use. In turn, these abusive fertilizing practices further deteriorated soils and created pollution that went both into the Aral Sea through groundwater circulation and into the air through dust storms. The desiccation of the Aral Sea greatly increased the number of dust and salt storms in the area. Satellite images have revealed that there are up to ten major dust storms occurring annually in the region, most of them occurring between the months of April and July (Glantz 1999). While before, the pressure from the water surface dampened the strength of the northerly and north-easterly winds, the loss of the sea meant that it's protective action from the wind was significantly reduced. The receding sea left behind large amount of salt, and groundwater evaporation further increased the amount of salt from the exposed sea bed. The strong north-easterly winds now pick up the sand, salt, and dust, creating strong dust storms. The salt content in the dust made up about 30–40% of the volume in the summer, and was as high as 90% in the winter (Hydrometeorological Center of Uzbekistan). The storms are often between 150 and 300 km wide. The dust was distributed in areas far beyond the region - the dust from the Aral Sea region was found as far as 500km away from the original source (Micklin 2007). Some of the salt reached the intensively irrigated and cultivated soils, which even ruined the soil far away from the Aral Sea region. It was estimated that the average amount of salt removed from the entire dried seabed was about 43 million metric tons between 1960 and 1984 (Glantz 1999). The Aral sea desiccation period was accompanied by climate change. Before the desiccation period, the Aral Sea regulated the climate in the region by softening strong Siberian winds in the winter, and cooling off the area in the summer. The exact temperature increase resulting from the Aral Crisis is difficult to measure because the entire Central Asia region has seen an increase in air temperature, so the effects due to the Aral Sea were not isolated. Nevertheless, two studies based on observations made around the original perimeter of the Sea of the variations in air flows and temperatures have permitted to differentiate how much of the changes we see can be attributed to the larger scale trends and how much to the desiccation of the Sea per se. The two studies in question (Small and Molosnova) were realized with different methods, and arrive to similar conclusions: that the shrinking of the sea directly accounts for 50% to 66% –this proportion varies with pressure and seasons and remains high– of the warming trend. (Khan, Vilfand and Zavialov) In the period from 1960 to 2000, the average monthly air temperature has increased by 2°C to 6°C in the summer above and around the Sea(Zavialov 2005). Correspondingly, the air temperature has also decreased during the winter. The magnitude of the change was greatest southwest of the Aral Sea, where the north-easterly winds blow, as those winds got stronger. The result was shorter and hotter summers, longer and colder winters, and a decrease in precipitations. Concerning future temperature changes, estimates predict an increase ranging from 1.75 to 2.25°C on average in the region by 2050, rising more in the summer (2 to 2.75°C) than in the winter (1.5 to 2°C). In terms of yearly precipitations, they should increase by 5 to 20% in average by 2050, though again differentiated between summer and winter time. In summer they would increase by 5 to 10% in the north and decrease by up to 5% in the south, while during winter they would increase in both north and south of the Aral by respectively 5 to 10% and 20 to 25%. ( Ragab- Prudhomme 2002) The consequences of these changes pose a threat to populations who live in the area and human activities, as we are going to see. As population grows, the number of cars and all sorts of factories will increase. The local carbon dioxide concentration will increase, which will increase air temperature further. Some people may argue that warmer temperatures are good for planting and agriculture. They may argue that farmers can produce cotton or vegetation all year round, but where to find enough water for the necessary irrigation? There are not enough water resources even at the present time. Dry air that accompanies high temperature, higher carbon dioxide concentration and water deficiency will all lead to crop losses of agricultural plants. High temperature will additionally reduce the amount of grass on the plain territories which in turn will lead to a decrease in natural fauna and cattle breeding (Lelevkin). Air temperature will further increase due to geographical location of regions and the global warming effect. Warming temperatures will further evaporate water and farmers will have to use more water to grow anything compared to previous decades. This will speed up even more water usage, without counting the population growth factor. The water value in the region will therefore continue to increase, and hopefully a change in practices will eventually occur. It would seem unlikely that an inland sea in Uzbekistan could affect something so vast as earth’s climate. Yet the truth is that the shrinking sea and salty dust storms have already changed the climate in the region to the point of an unlikely return to the stability once present in the area. With the shrinking sea there is not enough surface area to disrupt frigid north winds. Nor does the sea contribute the moisture it once did to the snowfall in mountains of neighboring and more distant regions. In addition to the temperature steadily increasing the dust and salt storms are coating the mountain glaciers nearby and causing a decrease in the overall volume of ice. The degree of melting is over twelve times the rate of the pre-cotton growing era and as there is less moisture in the air to replace the dissipating snow the glaciers continues to diminish. As the glaciers continue to melt the weather will become less likely to experience the sort of seasonal stability it once did. We have just looked at the intricate behaviors of climate systems in the Aral region, including their interactions and the chain reactions that we call positive feedbacks. Not only did they reshape the landscape and natural balance of the region, they also affected dramatically the populations that live or used to live in this area. Public health, access to drinkable water, migrations due to changing landscape and consequences of vanishing wildlife are all matters that turn out to rely on stable climatic and hydrologic conditions. Appalling observations that followed the climatic changes of the past decades have increased the toll of the irresponsible decisions that were taken by the Soviet Union in the 1960s and of the inactions that followed. Endemic levels of anemia, respiratory diseases and other kidney troubles were reached around the 1980s among the neighbor populations of the Aral region, without anything preventing such diseases from spreading since changes in local climate were at their origin. We will now explore the range of consequences on the human plan that these changes truly had. Throughout its desiccation since the 1960s, what used to constitute the Aral Sea was replaced by arid lands crusted with salt, and at an accelerating rate due to positive feedbacks as we saw. Both the abusive practices at the origin of the desiccation and the consequences of it on the landscape and local populations were obvious during this period, and inaction was therefore intentional. Even more so when a threshold was passed in 1990, with the Sea being split into two distinct parts: the North and South Aral. Only then did the community of countries directly concerned by the fate of the Sea officially react to start remedying the problem on a large scale. Yet the problem remained: the promises of those countries, which even created a joint fund to which they promised to allocate 1%of their GDP each year, were not respected even to the least. Unrealized projects and unfounded promises were repeatedly made since the 1980s by the USSR and the successive governments of the region, without anything ever being done due to being short on cash or the simple inability of governments to cooperate diligently. The first landmark toward the protection of the sea was made at the local level by a governor and local villagers, who managed to improvise an “artisanal” dam made of sand in the mid 1990s, allowing for the sea level in the Little Aral (Northern Part of the split) to stabilize instead of progressively drain its water in the vast plains of the South Aral. This dam though did not withstand time, and had to be repaired if not rebuilt a few times until it was eventually abandoned at the end of 1990s. In addition to the role it played in preserving what was left in the Little Aral from spilling into the evaporating desert, this dam was a first effort in what was going to become a major project financed by the World Bank. Indeed, the World Bank had been closely following the situation without being a real player up to then, when it finally accepted to finance an 85million dollars project initiated and realized by Kazakhstan, to rebuild dozens of miles of canals and build a proper dam at the southern border of the Northern basin. This more up-to-the-task achievement quickly took shape, as canals were improved starting in 2001 and the dam was finished in the summer of 2005. Estimates were, as found in an article in Science dating from February 2005, that ”Within 3 years [after the Kok-Aral Dam is built] , the Small Aral is expected to rise at least 3 meters and cover about 1000 square kilometers of now-dry former seabed, extending its surface by 25%”. The facts were that as early as March 2006, water level in the “Little Aral” had risen from 38.4m to 42m, or a rise of more than 3.6m during the 7 months after the Kok-Aral Dam was built! (Conant 2006) Its surface grew by about a third within a year after the dam was built (New Scientist 2006). The consistent improvement in irrigation canals thanks to new technologies replacing the outdated and rotten infrastructures from Soviet times was a key element in restoring a larger flow in the Syr Darya River, with gains in efficiency as well as a bigger proportion of it now being redirected toward the Little Aral. That represented an increase of about 793,000 cubic meters in water, literally replenishing the local fauna and making the lives of human beings around it so much easier. The flow of the Syr Darya itself doubled pretty quickly, rising to around 800cubic meters per second (or 28,000cubic-ft/sec) (Conant 2006). Spillovers from the Northern sea to the Southern one started occurring around the same period, recreating a viable and regulated environment for certain species of fishes that had not entirely disappeared to flourish, and by the same occasion fishing opportunities for the exuberant locals. The newly available water was a formidable real life experiment in which visible changes in biodiversity occurred at a striking rate: as reeds started appearing along the river banks, flees that were long gone and were an essential food to local fishes reappeared too, and quickly re-established the natural food chain. Asian foxes, wild donkeys and other mammals soon showed up in growing numbers, giving a more lively sight to the recently desert landscapes. The project is not at its end yet, and further improvements will soon come as a result of continued attention paid to water inefficiencies and depolluting the region from pesticides and other sources of soil and air degradation. Aside from that large project which was the culmination of decades of undedicated efforts among nations concerned, some other propositions have arisen in the past years to help further the improvements that have been occurring. One which caught our attention is to attribute to the Aral Sea the status of “World Heritage Site” from the UNESCO, in order to force a partial restoration of the Southern part of the sea. This partial restoration would be a realistic step toward lessening the human and ecological crisis from which the Aral region has suffered. It would also bring about more sustained international help as well as a push for cooperation between ethnics and local governments to deal with the causes of poor air quality and its consequences on populations (Glantz 2007). On a less optimistic note, though, the only large scale actions and results up to date were the product of focused policies in which Kazakhstan acted by itself, sometimes with the help of the World Bank. Although countries like Uzbekistan did not have their say and yet approved of the project, they did not contribute to it or showed any sign of upcoming contribution. Kazakhstan saw the share of its Agricultural sector shrink in its now “petrol-enriched” economy from 27% in 1991 to only 5.6% in 2006, while the share in Uzbekistan went from 37% to 26% during the same period (Gapminder 2008). These figures show how Kazakhstan has gained some relative freedom in redistributing the water from the Syr Darya, while Uzbekistan for which cotton growing still represents more than a quarter of the economy has remained more conservative in these matters and does not intend to apply the same quantity of effort in bringing back the South Sea to life as Kazakhstan did with the North Sea. It must be admitted that the South Aral, or Arals since the Southern part is itself separated into two bodies of water, West and East, cannot be rejuvenated to its 1960 level. 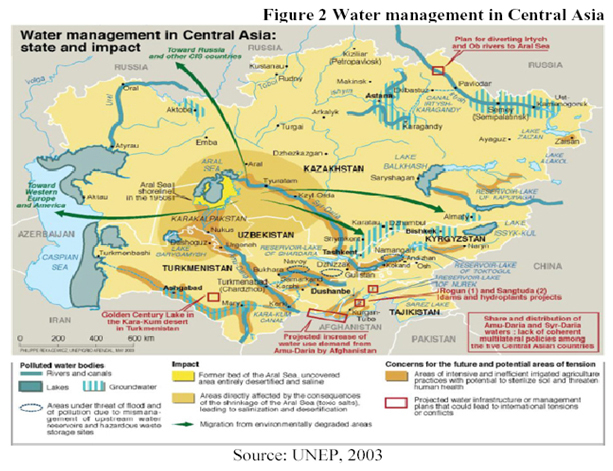 Hopes must be put on a partial restoration, and the South Sea being primarily on Uzbek territories, the active involvement of Uzbeks is critical to the restoration efforts that would help support the re-birth of the Aral Basin as a whole.